Pricing: To the fairness of all customers, please understand all our prices are non-negotiable. Deposit: A non-refundable deposit of HK$5,800 is required to secure your appointment dates and time. All outstanding fees are due on the first photo session day. Client usage: All digital JPEG images provided to the Clients are for clients personal usage and not for commercial usage. Please write to us for quotation on commercial usage. Digital images: Please understand that RAW and unedited JPEG images are not for sale as they do not reflect the quality of our works. Retouching: The images will be edited based upon the photographer’s standard editing process. This generally covers adjustments to exposures, lighting contrast and black and white conversion. The said editing is included in the standard package fees. Any creative artwork (such as requirement for slimming of your body, change of color of your home’s furniture, head swapping, removal of any items from the pictures, or any other works other than our standard procedures) are charged from HK$1,800 and up dependent upon your requirements. All photos are copyrighted by Maria Z Photography. Rescheduling and cancellation: If client needs to reschedule their photo session, please try to notify the Photographer at least 1 week in advance, or at least as soon as possible after the issue is identified. A rescheduling fee of HK$800 is imposed for any rescheduling less than the required timeframe. 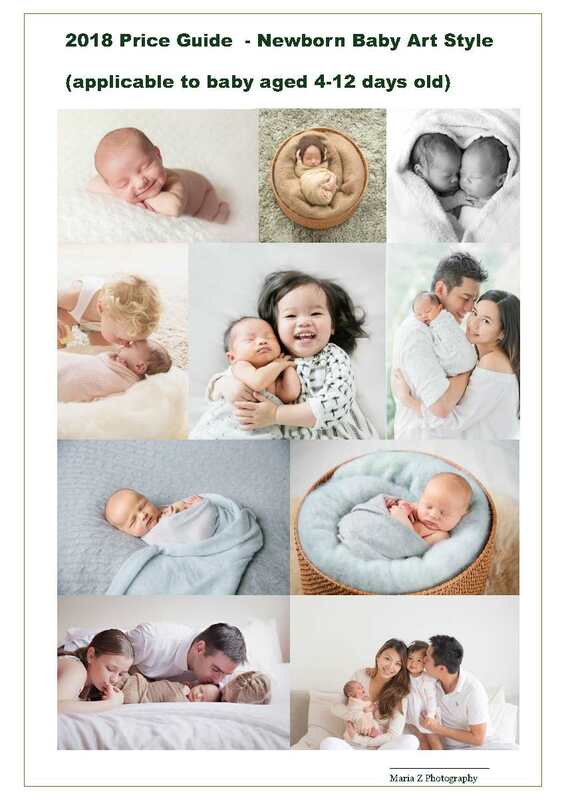 For newborn (baby art) sessions, we recommend you book your newborn session when you are aware of the expected due date. The private on-line gallery will be available for viewing approximately 2-6 weeks after the photo-session. We understand our photo style are not for everyone. Whilst you may think the newborn baby art session may be a great gift for your friend’s newborn baby, this may not be the case. 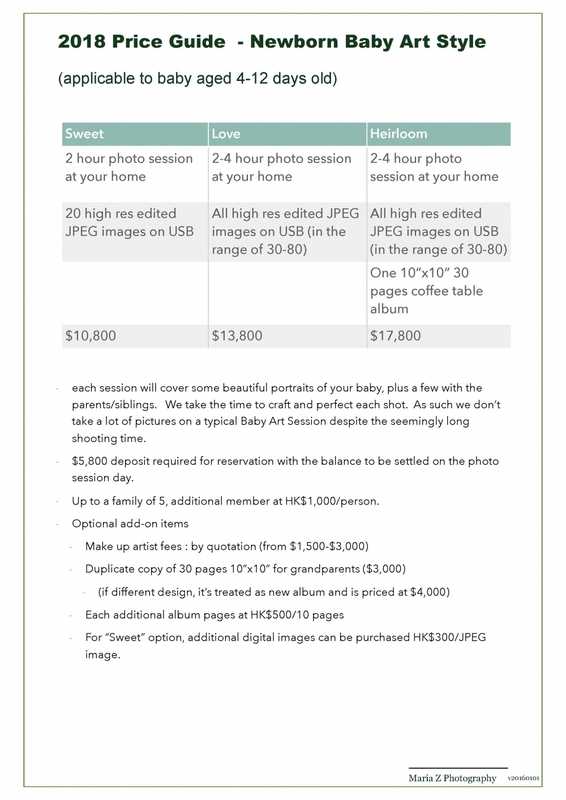 As such, we do not offer gift voucher for the Newborn – Baby Art Session. Thank you. For client who purchase the Heirloom package with album, please understand the album price is valid for the year of purchase. Please select the photos for inclusion in the album within 3 month after receipt of the on-line gallery. Please check with us for updated album price should you want to purchase album later. Please enjoy your sessions and put all your camera and videos aside during the photo-session. Videography either by smartphone or other means are not allowed in our session. Once you have read the above and if you would like to go ahead to book us, please contact us to check our availability. We will discuss in detail regarding your booking afterwards. Thank you. grace - i would like to ask if i want to take some family photos with my 2 years old daughter, how much would that be cost? or any packages that u can offer? I am interested to know what your rates are. I Would like to have a few family and individual photos made. Family = 2 adults, 2 kids. I am glad to know you and your beautiful pictures from Facebook, I am a mother-to-be and my husband and I are expecting our first child by the end of Nov (to be exact, my EDD is 26 Nov 2013). I would like to know what your rates are and I am looking forward to hearing from you soon. Your pictures are really great, which capture the true moments of moms and babies! May I know your rates for maternity and newborn? My expected due date is 26 Nov 2013. Thank you very much! I’m looking to have a family photo session outdoors the week of Oct.14th. We are a family of 2 kids and 2 adults. Can you email me your availability and your rates?